For the past two years, the SheSpeaks community has shared their unbiased opinions with brands like Heinz, AOL, L’Oreal and Ghirardelli. A large number of our members have have blogged about the products that SheSpeaks has sent to them, which has delighted our clients. Many of these clients have expressed interest in working more closely with SheSpeaks to identify bloggers in our community and include them in programs. Based on this interest from our members and from our clients, we’ve created SheSpeaks Blog Programs. You may have noticed a blogger survey on your Member home page. We’ve been gathering information on SheSpeaks bloggers for the past few months, including frequency of updates, traffic, comments, topics, quality of writing and use of advertising and advertorial placements. To be part of the Blog Program, bloggers don’t need any minimum level of traffic, but the blogs must be accessible without a password and free of any objectionable content or imagery. When we launch a new program, we will select a variety of blogs from our Blogger Members. The most important qualifications will be topic and level of activity. For example, we’ll match bloggers who discuss food and cooking with food products, and we’ll look for blogs with multiple posts per weeks and active comments. Our blog programs are the same as our member programs. We’ll invite you to participate, fill out a short survey, and then you’ll receive the product at your registered address (please make sure the address in your profile is up to date!). Once you’ve received your product, you’ll have access to Test Central on shespeaks.com, with product information, video, and other content. You’ll also have access to the discussion boards for the product, and the ability to share your blog post with other members. Once the program is done, we’ll ask you to fill out a brief survey. If you’re not comfortable disclosing your relationship with SheSpeaks, then we ask that you don’t register for our blogger programs. Over the next few months, we’ll continue to develop our blogger programs and tools, and your feedback is ciritical to help us build the program. 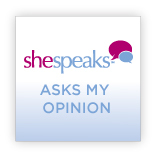 You can send feedback directly to blogteam@shespeaks.com, or participate in our blogger discussion forum. We look forward to working with you.